"For once you have tasted flight you will walk the earth with your eyes turned skywards, for there you have been and there you will long to return." -Leonardo da Vinci. The undead are known locally as Zengre (Zombie Engineer Element). They roam forgotten corners of Nimbaterra, usually in the form of clockwork powered mustelids. They are preserved remnants of their previous life, muscles long atrophied, with their remaining joints, tendons and inner organs replaced by machinery where needed. Most are long deceased and possess only basic intelligence. The few who retain memories of their past life gradually spiral into madness the longer they fight. The eyes of Zengre often glow a bright red hue, this comes from the Soul Ruby encased within them and contains the remnants of their soul. The majority of Zengre are mustelid in form with weasels, stoats, mink and badgers as the most common varieties. Outfitted with clockwork gears, hydraulic pumps and other mechanical parts, the Zengre appear more machine than biological life. They generally have a few exposed gears with their original skin covering the bulk of clockwork beneath. 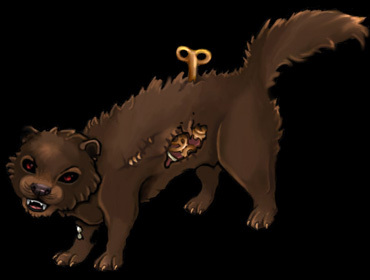 Most Zengre appear as a taxidermied specimen complete with teeth, fur and claws, but it is not unusual to see undead who have been fully replaced by metal. Those Zengre have been serviced and repaired so many times that they resemble their original species only in shape. There is a wind-up mock Zengre found within one of the vending machines inside Club Nimbus. It is a novelty item often used to prank guards and other residents. Zengre fall into two main categories: Basic and Sentient. Sentient undead appear much as they did in life. They possess more skill and precision than Basic Zengre. The Sentient are controlled by the spirit left over from their past life. Any clockwork they have been outfitted with has been assembled to allow simple movement as their biological functions had failed upon death. Basic Zengre occur when a spirit has been apart from its body for too long and only the hollow shell remains. These are commonly employed as spies, cannon fodder and for conducting small tasks such as household chores and deliveries. Being detached from a spirit allows Basic Zengre to follow more complex instructions and remember everything they see or hear. Basics no longer have any memories to draw upon and are not easily distracted. They are valued so highly that when their numbers run low, Cassandra is known to collect taxidermy and assemble them into new recruits. All Zengre are fashioned from crude windup clockwork including being fitted with bombs, poisons, traps and anti-tampering measures designed to take out any who would try to strike them down. A nearly indestructable core keeps them going should they fall in battle. Explosions destroy the core Soul Ruby and, if sentient, allow the creature to rest at last. Zengre are regarded as abominations and pests on the Nimbaterra Isles. Any active Zengre found on the isles will be instantly dispatched. Engineers within the Club refuse to salvage any part of a deconstructed Zengre, as the Soul Ruby contained within them often corrupts the internal components and is known to thrive within new creations. The dispatched Zengre are destroyed completely by being thrown en masse into an incinerator. The remaining ashes are then dumped far and away over the cliffside as to ensure no sinister remnants will seep back onto the isles. There is a well known bounty of 1,000,000 on the pelt of Cassandra, Queen of the Zengre. It is unlikely this reward will ever be paid out as Cassandra sends only her minions to the isles, knowing much better than to travel there herself. Patrons will rarely see a Zengre on the main isle due to this kill-on-sight policy and in part to the well maintained security of the Club. Art depicting Tacoma in battle against invading Zengre with Cassandra commanding her army to the right. A white Ermine known as Cassandra is known for creating and commandeering Zengre. She sends them on a trail of conquest across the Isles, threatening any who have crossed her in the past and ensuring compliance from the residents of Nimbaterra. Death now being a temporary end to life, these intelligent undead view a defeat as a minor inconvenience. They march tirelessly with little need for food. Zengre draw power from ambient magic around them such as minerals, enchanted items, mechanical scraps and other imbued raw materials. With no fear of death or a sense of urgency, the Zengre have a great deal of patience in battle. They lie in wait and strike at the best possible opportunity. Cassandra grew up on the Eastern Isle of Zephyr and was good friends with Lunati. The two loved to talk machines and engineering together and had many interests in common. Young Cassandra endured relentless abuse from her peers. Lunati stuck up for her whenever possible and they traveled together for safety. Cassandra was a few years younger than Lunati, but they were incredibly close. As Cassandra grew into adulthood, she realized she had a crush on her childhood friend. The two had a falling out before Cassandra could confess her feelings to Lunati. Cassandra grew increasingly mean-spirited from this point on. She delighted in the pain of others and went out of her way to be horrendously cruel. Her fascination with machinery endured, but her devices became objects of torture and dismemberment. She isolated herself and spent all her free time on engineering projects. Some time after these events, Cassandra's father became sick. She needed to find medicine to keep him comfortable, as he was likely going to succumb to his illness. Desperate, Cassandra arranged a flight to Nimbaterra to bargain with the association of the club for the island's infamous painkilling poppies. But new laws dictated that the poppies could no longer be exported, and she would have to bring her father to the isles, who was in no condition to survive the flight. Ultimately, Cassandra's pleas were denied. Returning empty handed, Cassandra was driven mad with rage as she watched the health of her father decline. She swore she would destroy Tacoma and bring the avians of Nimbaterra to justice. Her father soon passed away, in horrific pain and angish. Cassandra was lost. She began her descent into dark magics, studying all that she could. Her newfound knowledge in necro-magic was then used to return the breath of life to corpses in the form of Zengre. Many of these souls belonged to living creatures who had suffered greatly in their last moments on earth, and now seeked revenge upon the living. All the while, Cassandra still lusted after Lunati and she thought of ways she could cause pain to the person who "stole" her love interest. All of her energy and hatred was directed at Tacoma, and she swore she would bring the inhabitants of Nimbaterra to justice. Cassandra worked tirelessly to rebuild the bodies of her victims, subsituting bone, brass, copper or steel for any missing body parts. These strange creatures would go on to become the Zengre, who continue to plague the citizens of Nimbaterra even today. A single Zengre out of Cassandra's army was found to be good. It is a defector, a warning. This is Kyren, the good Zengre. She is a very small, faintly glowing least weasel and the best friend of Cenia, Cassandra's sister, who had been equipped with the same mechanisms as other Zengre. One tiny thing went amiss in her production. Her wind-up mechanism is not an explosive or weapon, it is a music box. She serves as the canary in the coal mine, alerting the living that an invasion will soon take place and to seek cover. Tacoma quickly became aware of Kyren's benign nature but disliked this Zengre regardless. Cassandra's army was oblivious to the defective Kyren for many years until Zengre were slowly outfitted with a weapon upgrade and Kyren refused. Her frequent evasion of these recalls raised suspicion. Once her behavior came to the necromancer's attention, Kyren was quickly singled out and decommissioned for a brief period. Her battlefield memory was retrieved and, instead of destroying the defector, Cassandra hatched a wicked plan. All future Zengre were to be outfitted with the music box mechanism, tricking her enemies into believing it was the innocuous Kyren when, in fact, the revised Zengre would be armed with either a gas or explosive. A great number of innocents, falsely believing they had time to escape, were left maimed or killed by Cassandra's nightmarish army. Kyren has since had alterations to give her a distinct sound from the rest of the army, in addition to her tracking chip removed. She devotes her time now to stalking the Zengre army and warning folks, as she always used to do. Still, Kyren was never fully accepted by Tacoma, who continues to hate the entire undead army indiscriminately. 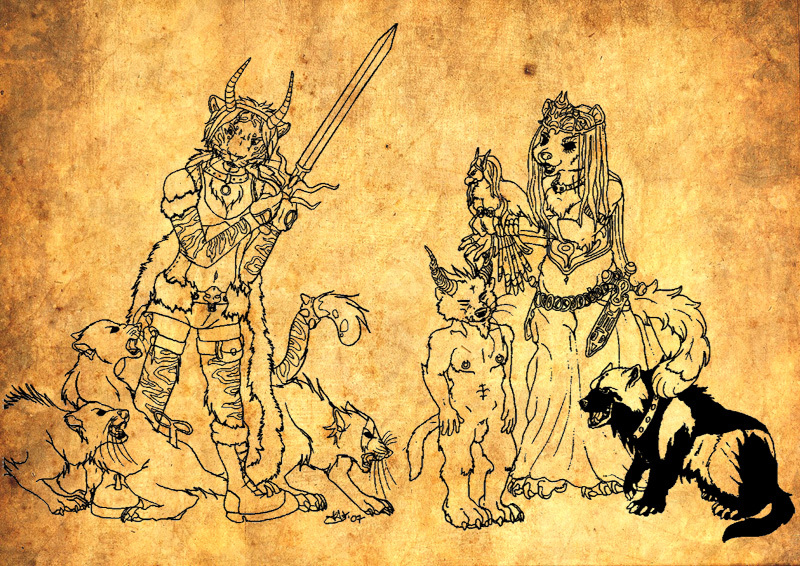 Kyren has been abducted by the Werewolves and Harpies of Nimbaterra on many occassions. Kyren was tinkered with by an engineer, encouraged to dance on the bar to entertain guests and played with by a pack of treehouse stoners, thinking she was a toy from the vending machine. Kyren has since come to be celebrated on the Isles for saving countless lives from destruction. Text and Images © Tacoma. Layout by Lunati & Tacoma. 2002-2017.